I got to help work a VWA event! 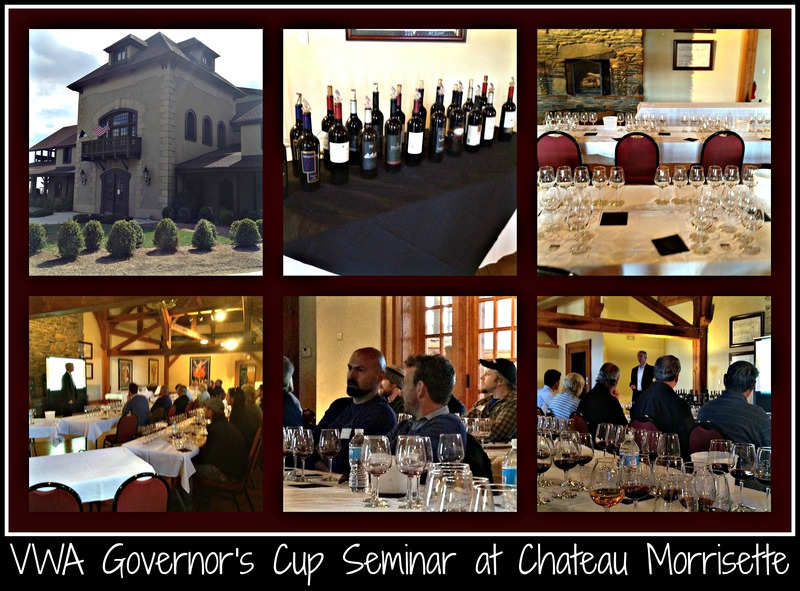 Yesterday, my friend Lynne and I were privileged to attend a VWA (Virginia Wineries Association) Governor’s Cup Seminar at Chateau Morrisette in Floyd, VA. This seminar is, from what I understand, organized as a way for wine industry people around the state to experience and learn about the wines that won high honors in the Governor’s Cup competition. There are a number of these seminars that are organized by the VWA… what a fabulous experience for someone who loves wine as much as I do! Chateau Morrisette was the host for this specific event on April 23, 2013. Sally, the vivacious woman who runs their events and festivals, couldn’t have been more hospitable or gracious. Since we had a few unforeseeable snafus, we could have all been on edge and anxious about the event, but having someone so capable and generous with the resources of her facility made things flow effortlessly. Jay Youmans of The Capital Wine School was the host and did an amazing job of explaining the background of the competition, the particulars of these events, and even stepping in to discuss his own findings on each wine if there was no one there to represent a specific winery or vineyard. I had the pleasure of listening to him discuss the 2012 Governor’s Cup wines a few months ago and learning about this new case of stellar wines was again a treat. He is the consummate professional but has a great sense of humor… if you ever have a chance to take a class from him at his wine school in Bethesda, I would highly recommend the experience. The challenge for Lynne and me came when we found out that the Executive Director of the VWA wasn’t going to be able to make it to the event… she had a flat tire and couldn’t possibly make the four hour drive in time for the Seminar’s 1PM start. Once we knew that she was okay and got all the informational emails about setting up the event, we set off for Chateau Morrisette. Thankfully, we were already in the area (with two cases of the Governor’s Cup wines), having taken the opportunity to drive out and visit another winery on our way, so we were able to head over to the winery early to start setting up. These seminars are pretty amazing. Each place setting has twelve wine glasses set, one for a taste of each of the twelve wines in the Governor’s Case. Since the other glitch resulted in our needing to use the winery’s glasses, Lynne set about placing Chateau Morrisette’s glasses on each individual’s placemats (1-6, then 7-12) while I opened the wines that we brought with us. The concerted effort of Sally (pulled into service to find the 348 needed glasses for the 24 registered attendees + her 5 staff members), Lynne (getting mats, glasses, water bottles, spit buckets, and napkins for each place setting), Jay (setting up all his AV equipment and quality-testing/smelling each wine to make sure nothing was corked or undrinkable), and myself (opening bottles and then pouring the individual tastes of wine with Jay’s help), we were able to help host a relaxed, enjoyable, and informative afternoon for all who attended. If you have a chance to visit one of these fine wineries or taste any of these tremendous wines, I would heartily suggest you do so… they’re outstanding! This entry was posted in Wine, Wine Tasting and tagged Chateau Morrisette, Governor's Cup, seminar, The Capital WIne School, VWA.